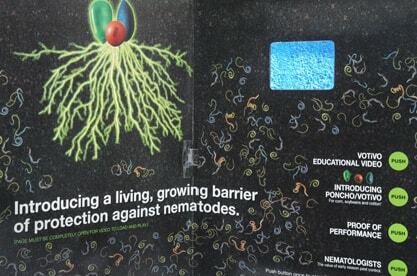 A revolutionary new scientific agricultural breakthrough demands an equally revolutionary introduction. 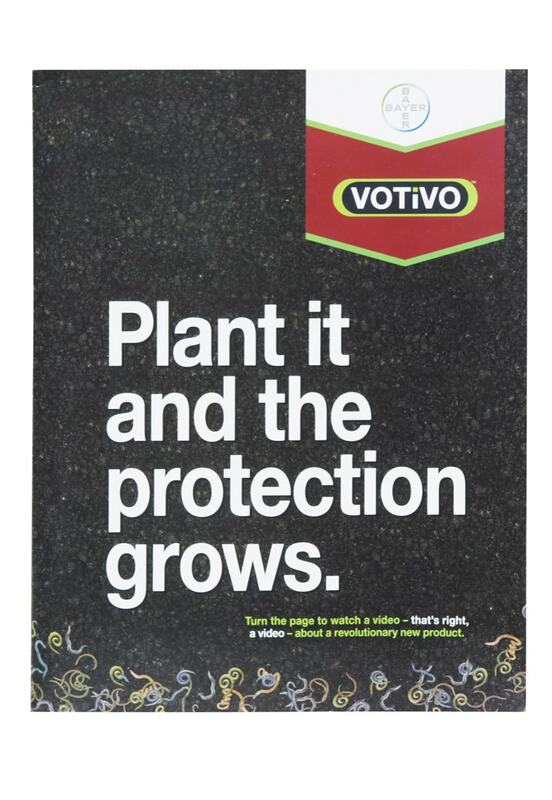 Bayer CropScience wanted to launch VOTiVOTM - a breakthrough biocontrol seed treatment in corn, soybeans and cotton - to select growers and seed companies who would use it for testing...providing a firsthand look at its unique protective properties. Farmers are a notoriously tough crop to market to. They are seasoned specialists with generations of knowledge and first-hand experience. They are typically ambivalent if not downright hostile toward traditional sales materials (particularly when text heavy), tending to be equally as skeptical and distrustful of new products and methods. 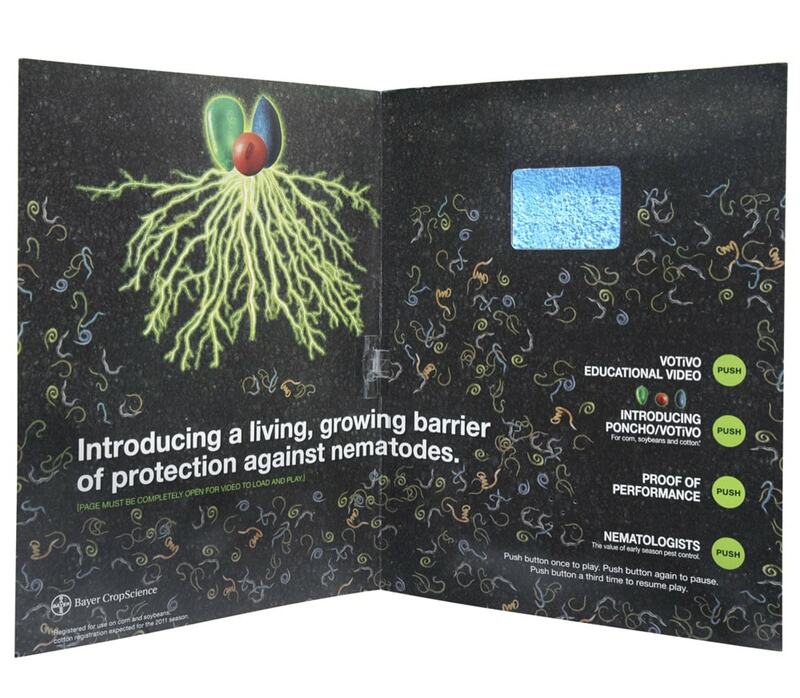 Rather than risk disengagement with a mass of scientific text, Americhip and Rhea + Kaiser worked with Bayer to embed Americhip’s proprietary Video in Print® technology inside the sales leaflet/insert itself. Upon opening the leaflet, Americhip’s proprietary 2.4” screen played a dramatic animated video. Following this, farmers were able (and encouraged) to continue the interaction by pressing chapter buttons that allowed them to browse through short informational bytes of video, presented by Bayer CropScience product managers and well-respected University researchers. The video brochure delivered a unique sales aid with an impossible to ignore message. It targeted its key demographic perfectly, immediately engaging the audience and holding their attention on an information-heavy subject. The experience was further enhanced by the video’s high def quality and crystal clear sound. What’s more, the use of highly credible spokespeople in the short informational videos helped to alleviate the farmers’ usual skepticism. This video brochure got the job done, delivering exactly what Bayer wanted to achieve for VOTiVOTM in the agricultural market. Rapid, sustainable growth.